Яргин С. В. Unfair practices in the publication process on the part of editors // Молодой ученый.  2016.  №20.  С. 34-40.  URL https://moluch.ru/archive/124/34198/ (дата обращения: 25.04.2019). Unfair practices in the publication process committed by authors (plagiarism, misquoting, gift or honorary authorship, hidden conflicts of interest, duplicate publication/submissions etc.) are well known [1–3]. Less frequently discussed are overt or disguised violations on the part of the editors, who are expected to engage unbiased reviewers and assure selection of manuscripts for publication based solely on scientific quality. Confidentiality is to be maintained throughout the review process . Violations of these principles sometimes occur  but are difficult to prove. A delay of the decision ‘to publish or not’ occurs frequently . Biased reviewers can cause delay repeatedly requesting insignificant changes. Sometimes the author, having not seen a proof, unexpectedly finds his text published . Certainly, it can be always objected that a review process needs time; the responsibility may be with a reviewer delaying submission of a comment (reviewer tardiness) . For example, the journal Arkhiv Patologii does not inform on its decisions for long time and rejects articles, which are of potential importance for the healthcare; commented in . 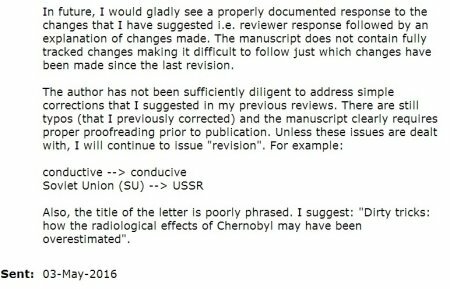 Letters with references to the articles [10–12] have been submitted some time ago; two of them were rejected, one has been under consideration since 2015, recently resubmitted (Example 1). Considering potential importance for public health and research, arguments from these letters were published in [13–16]. In the author’s opinion, a considerable delay of a decision on a manuscript, having potential significance for science or public health, can be a justification of a second submission of the same material. Accepted articles sometimes do not appear in print for years ; if the journal is open access, and the article is of importance, the accepted version can be made available e. g. on the ResearchGate. Another problem is the copyediting of accepted manuscripts. The copyediting may improve the grammar and style; however, sometimes it distorts original meaning, which may discredit the author and/or the message of his article. There are also overt violations such as distortion of the text or references resulting in wrong statements or citation. How should the author react? If an accidental error appears probable, the matter can be discussed per e-mail and corrections made. If there are reasons to suspect malicious intent, a discussion might be both disappointing and useless. Sometimes corrections are made but other text passages or references concomitantly modified (Example 2). The motives are not always clear. There are suspicions that auxiliary personnel, insufficiently controlled by editors, may be acting in accordance with interests of a third party endeavoring to discredit the author, to impart awkwardness , or even to make the author formally responsible for wrong statements or citations . In some cases, when the proof had not been sent to the author, it is difficult to retrospectively determine, whether mistakes had been made by the author or copyediting  (Example 3). Making every effort to get published an important paper, the author may see no alternative as to agree to a distorted version, or to make only essential corrections disregarding awkwardness of the copyedited text. 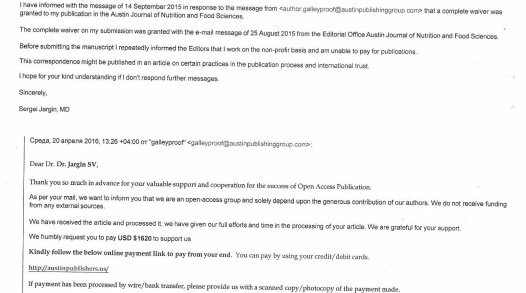 Paid open access publications is a separate topic; some publishers grant complete waivers per e-mail, but later the author receives an invoice and reminders (Example 4). 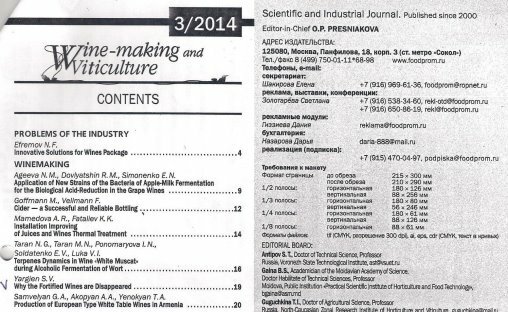 In this connection it should be mentioned that the journal Molodoi Uchenyi — Young Scientist (http://moluch.ru/) , where the author has cooperated since 2012, publishing in English and other languages, always works quickly and reliably. Finally, publication of unserious materials in congress proceedings should be mentioned; more details are in . In conclusion, unfair practices by some editors can be not only harmful for research and practice but also undermine international trust. The publication process and peer review should be as transparent as possible. Example 1. A letter with reference to the article , where derogatory idiom such as “dirty tricks” had been applied, was under consideration since 2015, recently resubmitted. Reviewers repeatedly requested various changes. A fragment from a reviewer’ comment is presented here as illustration. The arguments from the letter have partly been published in [13,16]. Example 2. The article  was changed by the copyediting. Compare references 48,66,68 in the 1st and 2nd versions below. In the end, all necessary corrections have been made. Today, the article is published in a correct form. Version 1. Refs. 66, 68: the word “Ukraine” was added by the copyediting. Version 2. Refs. 66, 68 were corrected after the author’s request; but Ref. 48 was concomitantly changed. Example 3. The title page of the chapter  with the misspelled author’s name. Several referenced were confused in the text. The references could have been confused in the manuscript; but the proof was not sent to the author. The erratum was submitted but not published; it is available on the Researchgate; a screenshot is presented here below. Example 4.Some open access journals having publication charges grant complete waivers per e-mail but later ask for payment, send invoices and reminders. Fragments from correspondence are shown below. Example 5.The article  was changed by the copyediting, some sentences having become awkward or senseless. The erratum was submitted but not published; it is available on the Researchgate. Subsequent articles have been published correctly . Example 6.Captions to the illustrations in , being verbally correct, have been confused by the copyediting. The erratum was submitted but not published; it is available on the Researchgate. Example 7. An erratum submitted to the article in Russian language , changed be the copyediting. No reply has been received. 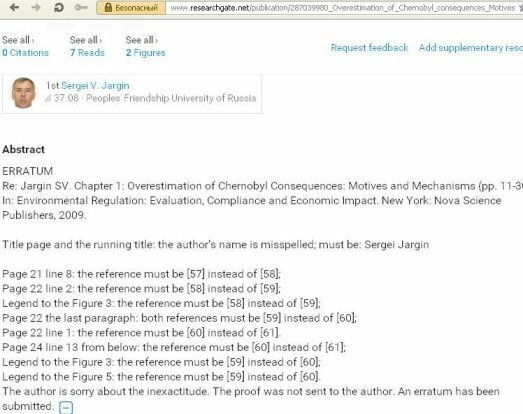 Example 8.The author’s name was misspelled on the contents pages both in English and in Russian languages. Besides, a mistake was made in the caption to the illustration (19th instead of 20th century) . The erratum was submitted but not published. Wallace M. B., Siersema P. D. Ethics in publication. Endoscopy 2015;47:575–8. Jargin S. V. Pathology in the former Soviet Union: scientific misconduct and related phenomena. DermatolPractConcept. 2011;1:75–81. Яргин С. В. О недобросовестности в науке. Молодой ученый — YoungScientist 2015, № 4, стр. 322–7. Cowell H. R. Ethical responsibilities of editors, reviewers, and authors. Clin Orthop Relat Res 2000;(378):83–9. Rennie D. Let's make peer review scientific. Nature 2016;535(7610):31–3. Яргин С. В. К вопросу о двойных публикациях. Укр. мед. журнал 2009, № 3(71). 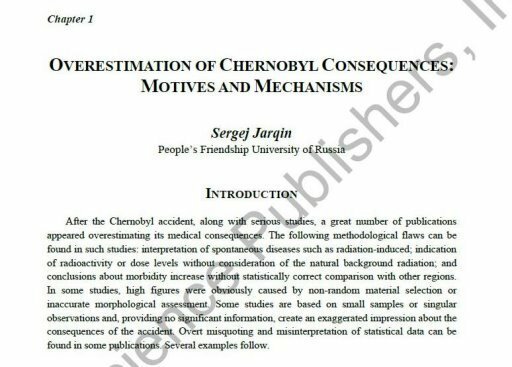 Jargin S. V. Chapter 1: Overestimation of Chernobyl consequences: Motives and mechanisms (pp. 11–30) In: Environmental Regulation: Evaluation, Compliance and Economic Impact. New York: Nova Science Publishers, 2009. Babalola O., Grant-Kels J. M., Parish L. C. Ethical dilemmas in journal publication. Clin Dermatol 2012;30:231–6. Jargin S. V. On the RET Rearrangements in Chernobyl-related thyroid cancer. J Thyroid Res. 2012;2012:373879. Rühm W., Woloschak G. E., Shore R. E., Azizova T. V., Grosche B., Niwa O., et al. Dose and dose-rate effects of ionizing radiation: a discussion in the light of radiological protection. Radiat Environ Biophys 2015;54:379–401. Khaltourina D., Korotayev A. Effects of specific alcohol control policy measures on alcohol-related mortality in Russia from 1998 to 2013. Alcohol Alcohol 2015;50:588–601. Katz A. R. Who is afraid of Volume 1181 of the New York Academy of Sciences? Under threat, the nuclear establishment plays dirty. Int J Health Serv 2015;45:530–544. Jargin S. V. Dose and dose-rate effectiveness of radiation: first objectivity then conclusions. J Environ Occup Sci 2016;5:25–29. 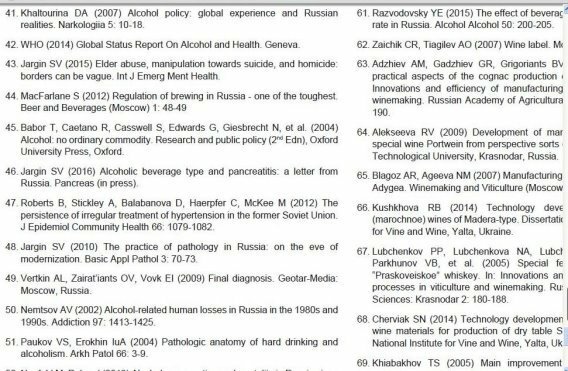 Jargin S. V. Alcohol and alcoholism in Russia: insider’s observations and review of literature. J Addiction Prevention 2016;4:6. Jargin S. V. On the RET/PTC3 rearrangements in Chernobyl-related thyroid cancer vs. late detection. Int J Cancer Res Mol Mech 2015;1(4). Jargin S. V. Stem cells and cell therapy: On the eve of scientific discovery. CellTissBiol 2011;5:103. Яргин С. В., Разводовский Ю. Е. Алкоголь и алкоголизм: что изменилось за полвека. Собриология 2016, № 2(8), стр. 52–57. Jargin S. V. Development of antiatherosclerotic drugs on the basis of cell models: a comment. International Journal of Pharmacology, Phytochemistry and Ethnomedicine 2015;1:10–14. Jargin S. V. Alcohol consumption by Russian workers before and during the economical reforms of the 1990s. Int J High Risk Behav Addict 2013;2:48–50. 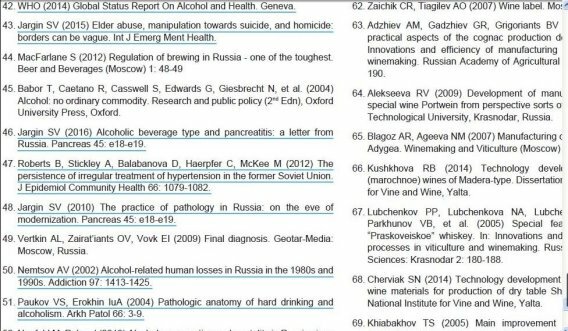 Jargin S. V. Alcohol consumption in Russia and some aspects of public health. Int J High Risk Behav Addict 2016;5:e26617. Яргин С. В. Почему исчезли крепленые вина. Виноделие и виноградарство 2014, № 3, стр. 19. Основные термины (генерируются автоматически): RET. Усечениекорней (апокопа). Например: zam = exam; pre sci = preliminary science examination; soph = sophomore; ret = tobacco cigarette. Было высказано предположение, что RET/PTC1 предрасполагает к следующей перестройке RET , в первую очередь, RET/ PTC3, второй по частоте после RET/PTC1. Обозначим множество REt – подмножество Rt, элементы которого оканчиваются состоянием среды. Что есть действие агента в среде? Перестройки ret/PtC1 и ret/PTC3r1 в клетках рака щитовидной железы, возникшего у жителей Белоруссии в период после аварии на ЧАЭС. On the contrary, the RET/PTC3 rearrangements can be associated with the patients’ age [50,51] and probably also with the progression of papillary TC [28,52].